Humans are pathetically weak. Our jaws produce an anemic bite force of only 200 pounds per square inch (psi), which isn’t even in the same league as the 3,700 psi of T. rex-equaling energy generated by a saltwater croc. Unlike many creatures, we possess no claws for slashing and maiming, nor can we rely on brute strength to stun and disable our prey. The name “tomahawk” is derived from the Algonquian term for “ax,” and it encompasses any hatchet-like tool with a lightweight head and small cutting surface attached to a 2-foot or shorter shaft. Despite its pre-Colonial roots, the tomahawk isn’t an obsolete battle relic — quite the opposite, in fact. This versatile tool, which excels at myriad tasks ranging from excavation to extraction, survival to self-defense, bushcraft to door breaching, has been experiencing a renaissance of sorts in the tactical community since the Vietnam War. 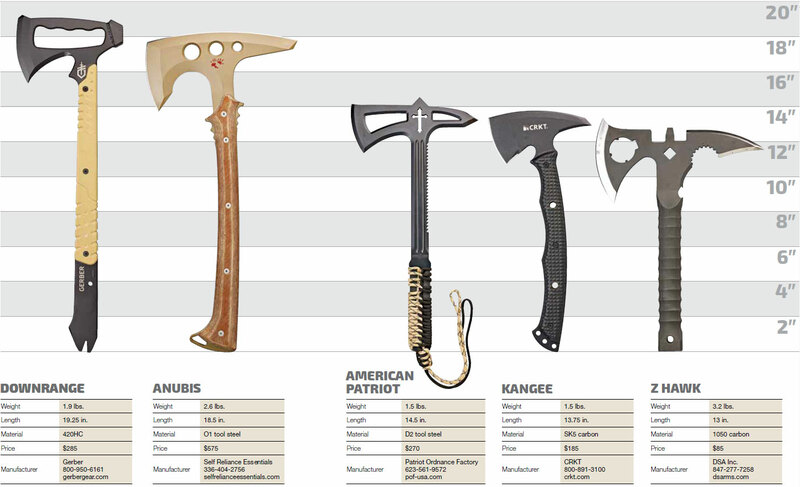 Check out these five unique tomahawks to find the original multitool that’s right for you. (Click on the thumbnail below). The post Hawks of Fury: Tomahawk Roundup appeared first on Guns & Ammo.